Every time somebody asks me about this blog, I get a bit antsy and say something along the lines of, “I’m not blogging much these days, but I’d like to start it up again.” This is my first attempt in awhile to revive this space and get back into the routine of sharing the going-ons of my kitchen. I’d like to get more creative with my food photography and also redesign the site, but I have to start taking more photos and posting more often for that to happen. I have also toyed with the idea of making this a personal blog versus just a baking blog, but for now everything is staying as is. I’ve been in the kitchen a lot lately and have been trying a bunch of new recipes. I’m getting more into baking with alternative flours and experimenting with vegan baking, but I will always love me a cookie made with good, old-fashioned butter. 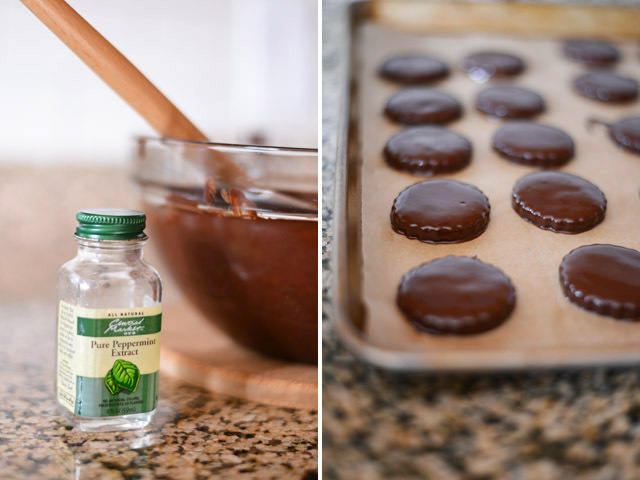 These homemade thin mint cookies are butter based and are also surprisingly from Heidi Swanson’s Super Natural Cooking. It is a pretty standard cookie recipe, but I suppose what makes them “natural” enough for Heidi’s cookbook is that they are made with real ingredients versus the crap (for lack of a better term) used in the beloved Girl Scout version. For the record, I love the boxed cookies–I order a few boxes every year, but this homemade version takes thin mints to a whole other level. 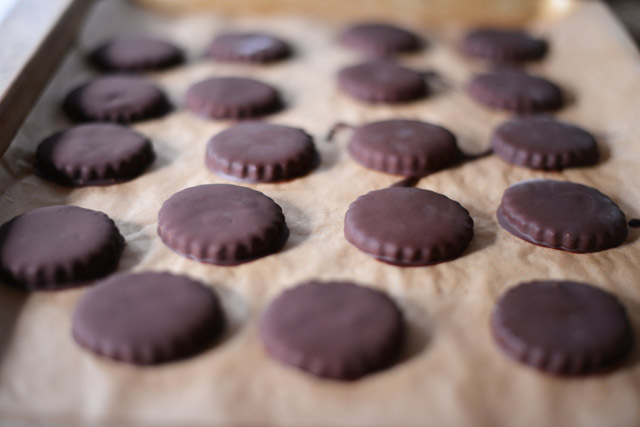 There are two basic components to thin mint cookies: the chocolate cookie base and the mint-chocolate coating. The chocolate cookies are made with butter, confectioners sugar, whole wheat pastry flour (all-purpose would work fine too), cocoa powder, vanilla, an egg white and salt. The dough is super chocolaty, easy to work with, and doesn’t really spread when baking. Once the cookies are coated in the mint-chocolate, you can throw them in the freezer to set. Et voilà! 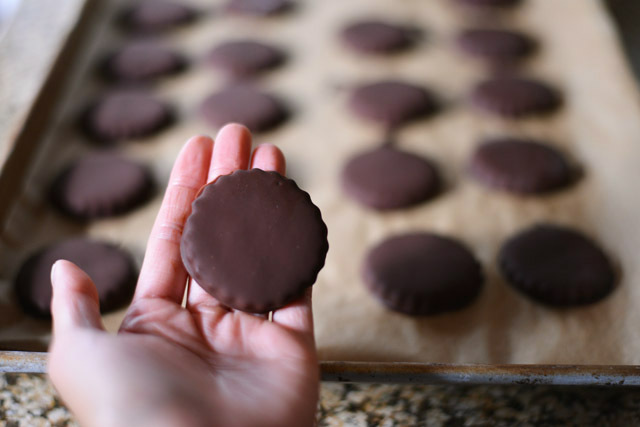 A beautiful, homemade version of everyone’s favorite Girl Scout cookie. If you’re interested in other homemade versions of store bought treats, here are a few more recipes for homemade peanut butter eggs, wheat crackers, and graham crackers. You may have to play around with the amount of peppermint oil or extract that you use depending on what you can get your hands on. Heidi suggests 1 1/2 teaspoons of peppermint oil in her book, but I don’t think you would need that much if it is pure peppermint oil. Simply Organic makes a peppermint flavor that is a mix of sunflower oil and peppermint oil and I suspect this may be the oil that Heidi is talking about since 1 1/2 teaspoons was the perfect amount when I tried it in these cookies. I have made a couple batches with peppermint extract as well that have turned out great–just be sure to taste it as you add it in. King Arthur Flour sells a pure peppermint oil that I am interested to try, so I’ll add a note on that if I do get a bottle in the future. Heat the oven to 350 degrees and line two baking sheets with parchment paper. In the bowl of a stand mixer fitted with a paddle attachment, beat the butter until light and fluffy. Add the powdered sugar and mix until combined, scraping the bowl as needed. Add the vanilla extract, cocoa powder, egg white, and salt and mix until everything is smooth, creamy, and well incorporated. Add the flour and mix just until the batter no longer looks dusty. On a lightly floured surface, turn out the dough and bring it together with your hands. Place the dough in a plastic bag and flatten it into a 1/2-inch thick disc. Place in the freezer to firm up for about 20 minutes. Once chilled, remove the dough from the freezer and on a lightly floured surface (or in between two pieces of parchment or plastic wrap), roll the dough out until it is about 1/6-inch thick. Use a 1 1/2-inch round or fluted cookie cutter to cut out the cookies. Place them on the lined baking sheets and bake for 10 minutes, or until they smell toasty and chocolaty. Place the baking sheets on wire racks to cool completely. In the meantime, make the mint-chocolate coating. Place a glass bowl over simmering water to create a double boiler (making sure the bottom of the bowl doesn’t touch the water), and melt the semisweet chocolate, stirring frequently, until melted and smooth. Remove from the heat and whisk in the peppermint oil or peppermint extract, starting out with only 1/2 teaspoon. Taste and slowly add additional peppermint oil or extract until the mint-chocolate tastes minty enough for you. Line the baking sheets with new parchment paper. One at a time, drop the cookies into the chocolate and use a fork to turn them to coat them completely. 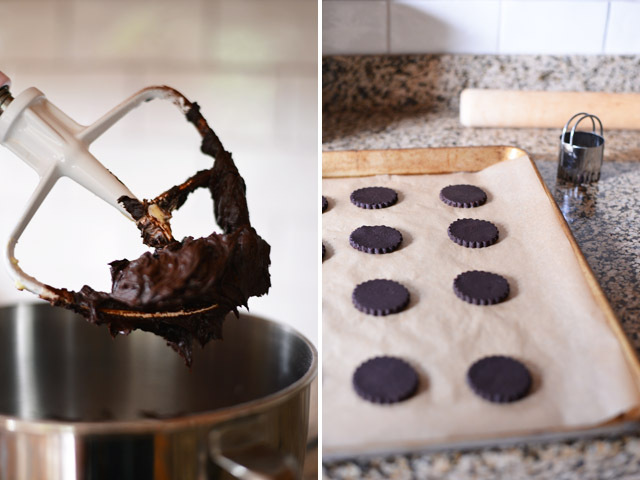 Use the fork to scoop up the coated cookies, holding them for a few seconds to drain off any excess chocolate, and place them onto the lined baking sheets. Once all the cookies are coated, place the baking sheets in the freezer to set. Once set, transfer the cookies to a freezer safe container and store in the freezer.